What was supposed to be a charitable toy giveaway has turned into a contentious dispute with some harsh words exchanged between Santa Clara County leaders. The Mercury News first reported on the Christmas Eve conflict that sparked between County Assessor Larry Stone and County Executive Jeff Smith when dozens of county employees were reportedly given expensive toys that were supposed to go families in need. 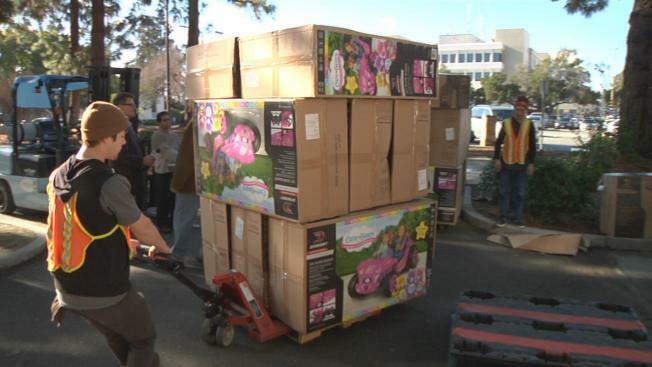 Nearly a million dollars worth of toys were donated this week by San Jose's Dynacraft Wheels Corporation. The goal was to give more than 8,000 electric cars and scooters – each worth hundreds of dollars – to less fortunate families for Christmas. "It's pretty nice what they're doing for us, for the people who can't afford one of these,” Suzanna Vizcarra said outside the Santa Clara County building where people lined up Saturday for the giveaway. Alex Lopez agreed. “I know a lot of people that need it,” he said. But dozens of toys appear to have been given to county employees this week, sparking quite a disagreement between Stone and Smith. “There’s no way to determine that – that I know of – other than it’s been estimated that somewhere between two and three dozen” toys were taken by his and other county employees, Stone said. When Stone learned about what had happened, he wrote an email to all the workers telling them that they need to return the toys. After he sent out the note, toys started stacking up around his office as employees did as they had been asked. "It was the right thing to do,” he said. However, in a strongly worded written statement, Smith told NBC Bay Area that the toys did in fact go to families that need them. Smith’s assistant Steve Preminger said county workers took about two dozen toys – with a caveat. “We would have said these are for low income families. If you know of some, we can give you one to take to somebody,” he said. Smith also took jabs at Stone, claiming he “jumped to conclusions, failed to educate himself about the facts and called the press with what he thought was a hot story." He said this is typical of Stone’s attempts to "ingratiate himself with the press." Stone disputed that explananation, instead accused Smith of both downplaying the situation and sending an email to employees that they aren’t legally required to return the toys. He also didn’t take kindly to Smith’s statement about his motives. On Saturday, crews gave away about 500 of the high-priced toys. Many children are going to have very Merry Christmases thanks to the donation, fortunately unaware of the controversy surrounding their gifts.